Click the name of a rule set. Click Add a New Call Rule. Type a name in the Call Rule Name box. Call Analysis—is available when you set the type to Wrap-up Code. It allows you to perform an action when call analysis detects a busy signal, answering machine, live person, or when no one answers the call. 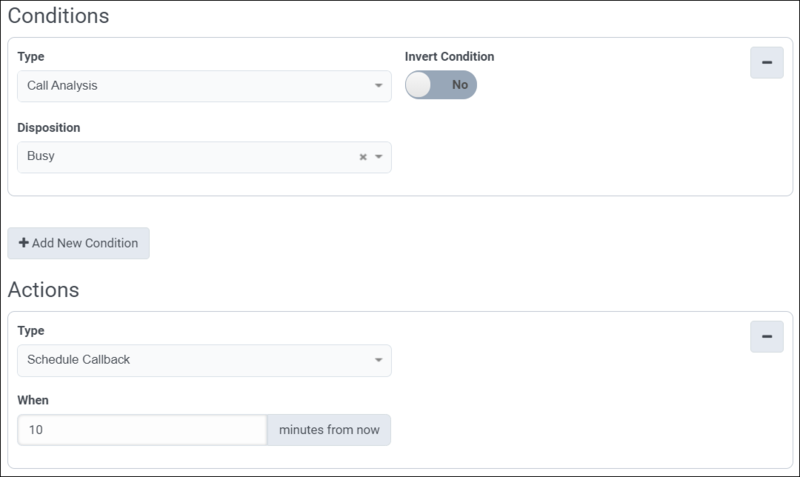 For example, you can set the rule action to schedule a callback in 10 minutes if a line is busy. The Disposition box allows you to select Busy, Machine, No Answer, or Person. In special cases, you may type a free-form call analysis condition instead. For example, you might type disposition.classification.callable.sit. The ability to enter free-form disposition strings is intended for limited use by customers with special requirements, as instructed by product support personnel. This feature supports any call analysis disposition that PureCloud Edge may return. Contact List Column—allows you to compare any column in the contact record to a fixed value. If you are using the Relative Time comparator, see Date-time formats for call rules. Contact Property—is available when you set the type to Pre-Call. It has two conditions: 1) Last attempt: Compares the last time that the system attempted to call a contact or a contact number (home, cell, work) to a user-entered relative time (number of days, hours, and minutes in the past or the future), 2) Last wrap-up: Compares the last queue wrap-up code result to a user-entered relative time (number of days, hours, and minutes in the past or the future) Notes: 1) If the contact list is new or if there are no previous call attempts, the rule evaluates the condition to false and the system does not take the rule action(s), 2) The last attempt condition only counts real attempts. Busy, preview skipped, rule skipped, internal error, callable time blocked, invalid phone number, number uncallable, contact uncallable, and callback disconnect evaluations do not count as attempts. As applicable for the type selected, choose a contact column, contact property, wrap-up code, or phone type as prompted. For example, if you chose Contact List Column, the system prompts you to select a column name. Select contact property, wrap-up codes, and phone number types in similar ways. To determine how the system makes the comparison, select a comparison operator (comparator). Perform an action when the condition is not met, set Invert Condition = Yes. Note: Inverting a wrap-up rule includes system-level wrap-ups in the evaluation. If you set up a rule to evaluate whether the wrap-up code isn’t x, y, or z, and then set a rule action, then every busy signal, hang up, skip, line disconnected, and so on, results in triggering the rule action since those system-assigned wrap-up codes are not x, y, or z. Due to the way the system currently works internally, it is not safe to assume that only configured wrap-up codes that are not x, y, or z solely triggers the action. For advanced techniques, see Test a contact column for empty, null, or zero values. Optionally, click Add New Condition. Repeat steps 2–9 to configure the condition. Note: Conditions join with the AND operator, so a call must meet all rule conditions for the overall rule to evaluate True. Configure actions for this rule to perform when its conditions are met. 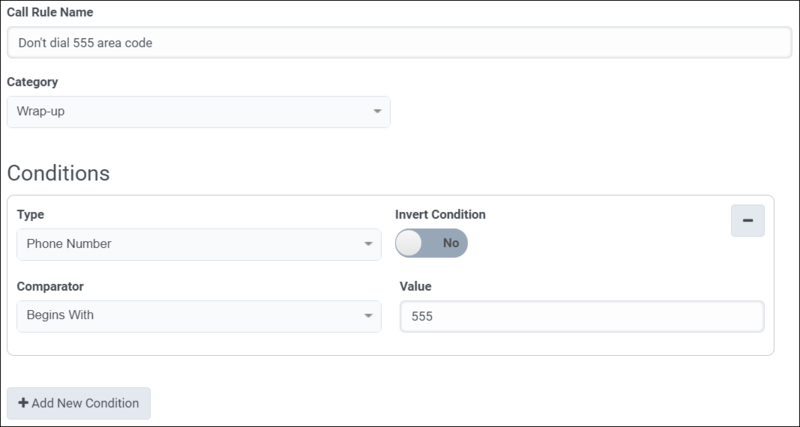 See Configure rule actions for details.